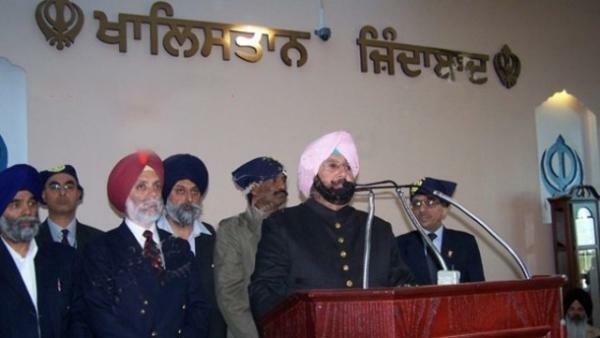 Chandigarh: The Punjab Police claims it has "clear and concrete evidence" of foreign funding in the cases of desecration of the holy book of the Sikhs, Sri Guru Granth Sahib, in recent days. The police has apprehended many of those accused of desecrating the holy book at several places in the state. Of seven such cases, police claim to have cracked five by arresting eight people. A senior police officer said that all seven acts of desecration of the holy book were interconnected, contradicting an earlier statement that said the events were isolated. 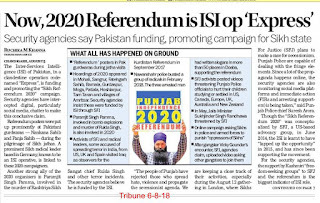 "The police has also unearthed the track used in foreign funding for carrying out the nefarious designs to vitiate the hard-earned atmosphere of peace and communal harmony in Punjab," Additional Director General of Police IPS Sahota said. He added that Dubai and Australia appear to be major landmarks in the funding trail unearthed by the the Punjab Police. Protests have flared across the state in recent days over the desecration of the Sri Guru Granth Sahib. Central forces were stationed today at Amritsar, Ludhiana, Jalandhar and Tarn Taran. The army held a flag march in Amritsar. The Congress and AAP leaders met the Punjab governor this morning and demanded the dismissal of the Parkash Singh Badal government and the imposition of President's Rule in the state. Chief Minister Badal convened an emergency Cabinet meeting to counter the crisis - considered the worst in his nine-year rule. The Shiromani Akali Dal - which rules the state with partner BJP - and the Chief Minister say "outside agencies" have orchestrated these events to foment trouble in the state. On Monday, Sikh groups and radical outfits had blocked highways across the state, demanding action against those responsible for desecrating scriptures. The protesters have threatened to continue the blockade till October 25 for three hours every day. 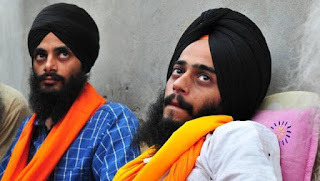 Chandigarh: Facing more embarrassment, Punjab Police today released the two brothers arrested last month in the main desecration case of the Guru Granth Sahib. Officials said they had "nothing more to investigate" against them. The brothers - Rupinder Singh and Jaswinder Singh - were released from jail in Faridkot. Punjab Police officials told IANS that the decision was taken as "police had nothing more to investigate against the brothers". Police had last week sought permission from a court in Faridkot district to conduct a lie-detector test on the brothers. However, the brothers refused to undergo the test. The release came just a day after Chief Minister Parkash Singh Badal sanctioned that the three desecration cases be investigated by the CBI. The Punjab government and police were under pressure from radical Sikh leaders who rejected the police investigation and demanded the release of the brothers. The arrest of the brothers was announced on October 20 by police with much fanfare saying that the main accused in the desecration case of Bargari village in Faridkot district had been nabbed and the "foreign hand" in their activities and funding had been established. On October 20, Additional Director General of Police IPS Sahota had told the media that the two brothers were arrested "after intercepting their mutual as well as Rupinder's foreign calls to Australia and Dubai. During interrogation, the foreign link as well as funding had been established". Deputy Chief Minister Sukhbir Singh Badal was present at the police press conference to announce the arrest of the brothers. Two people were killed in police firing in Behbal Kalan village in Moga district last month and scores of others were injured in violence across Punjab as protests erupted over the desecration of the Guru Granth Sahib. Police on Tuesday evening announced the arrest of two Sikh brothers, allegedly having links with foreign radicals, for the October 12 desecration of Guru Granth Sahib at Bargari village in Faridkot district — the first case of sacrilege that sparked protests across Punjab. Prime accused Rupinder Singh and Jaswinder Singh had been taken into custody five days ago, after their phone calls with their US, Australia and Dubai-based handlers were initially intercepted by cops, top government sources told HT. Rupinder, who hails from Panjgrain village in Faridkot district, was admitted to Apollo hospital in Ludhiana after he was injured in the Kotkapura clash last week. “During his hospitalisation also, the accused was receiving calls from his handlers, with whom they were discussing the delivery of cash, sharing details of bank account etc,” police sources said. Meanwhile, in a hurriedly convened press conference, deputy chief minister Sukhbir Singh Badal said the Punjab government would unearth all conspiracies behind the desecration at Bargari village that had led to widespread “emotional outbursts” across the state. Flanked by a battery of senior Akali leaders such as Ranjit Singh Brahmpura, Sukhdev Singh Dhindsa, Balwinder Singh Bhunder, Sikander Singh Maluka and Virsa Singh Valtoha, the deputy CM said the state government would arrest all culprits behind the incidents of sacrilege. “This conspiracy was conceived by rogue elements. It was an attack on the Sikh community. But we are committed to expose such elements and punish them. We will not let these elements succeed in their designs,” a visibly emotional Sukhbir said. Additional director general of police (crime) IPS Sahota, who is also heading a special investigation team (SIT) set up to probe incidents of sacrilege, said of the seven cases, police had cracked five. Following a tip-off that the accused brothers were missing, their cell phones were placed under surveillance. “Rupinder and his brother had been talking to their handlers abroad and discussing the payment promised to them for their act of sacrilege,” police said. The ADGP claimed that “foreign links” of the accused had been established during the initial investigation. The police said they had unearthed “clear and concrete evidence of foreign funding behind heinous cases” of sacrilege and that anti-national elements were using some greedy persons to lure them to carry out designs of disturbing peace and communal harmony in the state. The incidents at Kohrian (Sangrur), Nijjarpura (Amritsar), Ghawaddi (Ludhiana) and Baath (Tarn Taran) were of local origin, police said. Replying to a query, police denied any link between the Bargari incident and the controversy over pardon to Dera Sacha Sauda chief Gurmeet Ram Rahim Singh by the Sikh clergy. The police also shared audio clips of the telephonic conversation between Rupinder and his foreign handler and between Rupinder (9217660002) and Jaswinder, who was using his relative Gurbachan Singh’s number (9872214055). Rupinder talked to his brother on October 16 at 10:45am and to his handler in Australia on October 15 at 10:37am.